Three people were transported to the hospital with minor injuries sustained in a four-vehicle crash Thursday afternoon on North High Street in Hillsboro. Police and emergency medical crews from the Paint Creek Joint EMS/Fire District responded to the chain collision at about 2:45 p.m. near the intersection of North High and Beech streets. Southbound traffic was sluggish for about 45 minutes as police redirected the traffic flow. Two of the four vehicles were able to be driven from the accident scene. No further information was immediately available. 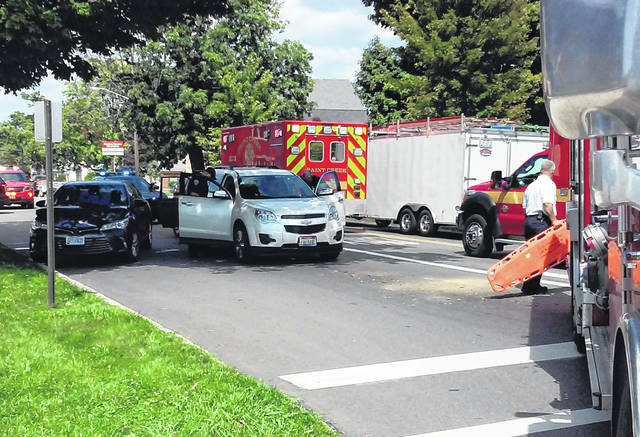 https://www.timesgazette.com/wp-content/uploads/sites/33/2018/08/web1_Crash-Scene.jpgThree people were transported to the hospital with minor injuries sustained in a four-vehicle crash Thursday afternoon on North High Street in Hillsboro. Police and emergency medical crews from the Paint Creek Joint EMS/Fire District responded to the chain collision at about 2:45 p.m. near the intersection of North High and Beech streets. Southbound traffic was sluggish for about 45 minutes as police redirected the traffic flow. Two of the four vehicles were able to be driven from the accident scene. No further information was immediately available.